Pope Francis arrived in America today and that is a good thing. Regardless of what you believe about Catholicism, or this pope’s particular views, I believe his visit, in general, will point the nation and the world in the direction of God and His Son, Jesus Christ. That’s a very good thing in an increasingly secular and lost world. Here’s why it’s good and what the pope should say to America. I will be honest that I have some mixed thoughts about Pope Francis. I’m glad he’s the first pope from South America (Argentina) and brings the dynamism, culture,and perspective from that wonderful part of the world. He’s a humble a man of prayer. I have friends who have known him for years and prayed with him quite regularly before he became the head of the Catholic Church. He has a great burden for the poor and disadvantaged of the world–as does the God of the Bible. His personal character is honest and self-effacing. He’s a very good role-model of a follower of Christ. He is a strong voice for truth on the evils of abortion, the importance of traditional marriage and family, and other important moral issues. His visit will get many people thinking about God. That can lead to great salvation. He doesn’t seem to understand how free enterprise (freedom) is a key to lifting nations out of poverty as has amazingly taken place over the past one hundred years. In that sense, he’s somewhat naive on the perils of socialism and communism (unlike his predecessor Pope John Paul II). He has bought into the ruse of man-made climate change which is not supported by scientific facts and appears to believe that a primitive state of nature is better than man taking godly dominion of the earth (for example, he is against air-conditioning). But he’s not the anti-Christ and here to usher in a New World Order. That’s way off the chart of being fair to the pontiff. He’s here in America to point us and the nations of the world to the worship of God and His Son, Jesus Christ. And according to Stephen Moore, an economist and journalist who I respect, this is what he should tell Americans during his visit. I cannot state it better than Moore does, so I will quote his article in its entirety. I, as with almost all of my fellow Catholics, am awaiting Pope Francis’ arrival this week with Christmas-morning type anticipation. 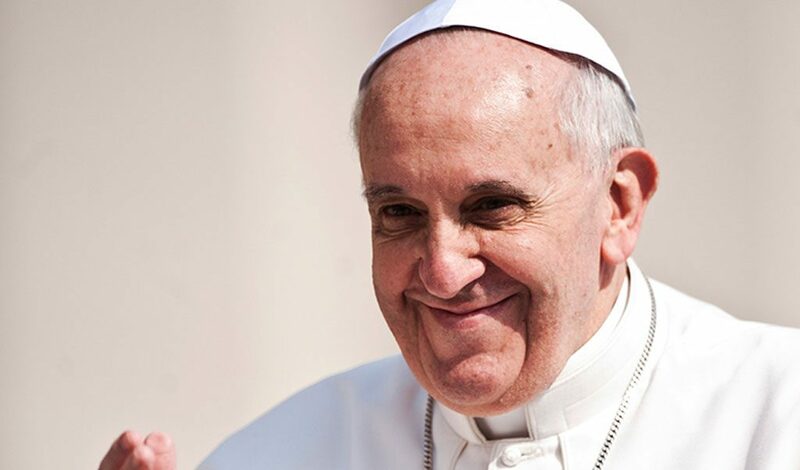 This relatively new pope is maybe the most popular man on the planet as he spreads the core Christian message of loving thy neighbor and caring for the least among us. He is an apostle of hope and virtue, and he comes at a perfect time when so many millions of Americans are mesmerized by such false idols as egomaniac Donald Trump. A national publication recently labeled me one of Francis’ four most severe Catholic critics, along with Ken Langone, a founder of Home Depot. This is arguably the man on Earth closest to God, but even he can’t empower governments to change the Earth’s temperature. Faith can move mountains but to expect Barack Obama and Nancy Pelosi to stop the rise of the oceans would be a miracle of epic proportions. The moral crisis of our time is not global warming; it is the holocaust of millions of abortions in America each year. If the pope can help change the hearts and minds of Americans on this issue, and reinforce the sanctity of every human life, he will have done more good for humanity than 1,000 Kyoto Treaties. Free markets create wealth, and it is the moral responsibility of all Christians to use our wealth in ways that help those most in need. As we look around the world, it is inarguable that socialistic economic models — from Francis’ native Argentina to Greece — are crumbling right before our eyes and making people poorer. A recent Heritage Foundation study finds that free markets are by far the best tools to reduce poverty. High taxes, trade barriers and big welfare states may be well intentioned, but they make the poor poorer. A benevolent government should enhance individual liberty, religious freedom and wealth. Much of this is wrong and the pope will do great harm if he repeats this message when he comes to America. Can unbridled capitalism lead to too much centralized power? Absolutely. But the people who believe with a “crude and naive trust in the goodness of those wielding economic power” are the communists and the socialists. Pope John Paul II understood this implicitly — in part because he lived under totalitarianism. In his zeal to rein in excesses of capitalism, Francis must not advocate putting more power into the hands of statist oppressors. Lenin, Mao, Castro and Pol Pot all promised that they stood with the working class, and they were some of the greatest oppressors of Christians and the poor in history. Christians must worship the Creator, not the created. The pope’s alliance with radical environmentalists is unsettling, to say the least. The green movement has a satanic track record when it comes to promoting human life and dignity. These are the people whose radical “Earth first” theology gave us the barbaric one-child policy in China and such population-control measures as forced abortions and mass sterilizations in India and Africa. It would be helpful for the pope to distance Christians from pagan values. God gave man dominion over this planet, and the pope is right to caution that we have a moral obligation to be good custodians for future generations. But the primacy of every single human life must come before saving polar bears and trees. Free-market capitalism promotes environmental improvement. We, as Catholics, are blessed with a pope who is this generation’s greatest communicator. His visit and his words can help inspire each of us to make America great and good again — a shining city on a hill. Francis, please give us hope and change.